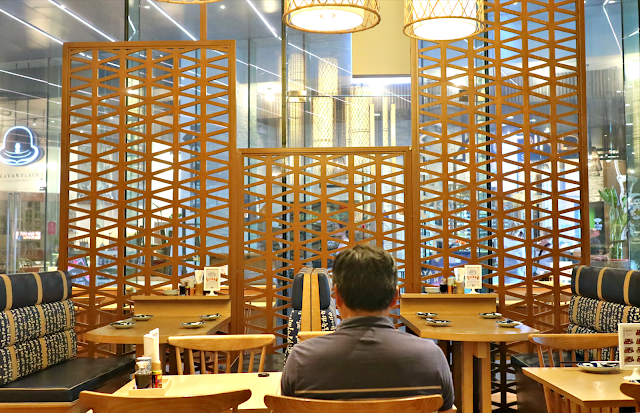 But knowing Raintree Restaurants, and their innovative means to redefine fine dining, I know Izakaya Sensu would not disappoint, even for the uninitiated foodies like us. Please, for those who loves drinking, I hope you won't take this against us and I sure hope to try one of their sake in the future. I do drink in certain occasions and I love trying out new flavors even if it contains more than 50 percent alcohol. An izakaya is sometimes known as Akachochin (lantern made of red papers), because these paper lanterns are traditionally found in front of an izakaya and often used as the signs for cheap drinking and eating. But knowing Raintree, you won't find any indication of it being cheap, so don't come looking for the red paper lanterns, instead look for that chic, contemporary look but still feels Japanese. You can find it along the food strip of Net Park building, however, Izakaya is tucked in behind Chotto Matte, which is a sister resto. The concept of Izakaya Sensu-Chotto Matte is much like M Cafe and Kabila. You can either sit in Chotto Matte and get their signature drinks and pair them with Izakaya's food, or the other way around. Feast your eyes with modern-styled interiors, a rich mix of warm and cold hues, imbibing a semi-industrial look with it's high ceiling and concrete wall finish. The huge cylindrical drop lights and wooden sectionals gives off a traditional Japanese look. My kind of color mix - white and blue, are strewn around in the chairs and porcelains. House tea served as a complimentary. To be honest, it was our first time in an izakaya and we don't know what to expect so we relied on their menu, which was extensive, to my surprise. Browsing through the beautiful menu was a joy and since we aren't experts on this we just relied on whatever caught our fancy and the first on to do that was Uni Isobe-Age (P 495). Served with flavored salts, this dish reminds me of being in a sand bar in Camiguin and having "Manong" open up a fresh sea urchin. Uni is the edible part of the sea urchin and it's beautifully kept inside nori packets with rice flour batter giving it a crisp twist. So, okay, for my first dish here, I should say I love it and I'll definitely order it again. By the way, this is a dining place that serves small-plated dishes as in "tapa-style." Next on our table is the Yakitori Omakase (P 275), these are veggies wrapped in thin bacon slices, swept in a classic marinade and then flame-kissed. Munching on everyone of these is pure comfort, the meat tender and the veggies cooked enough. A meal isn't Japanese enough without having platter of sushi (P 450), and I'll bet my life on this, Izakaya is one of the best place to fix your cravings for the fresh and clean taste of a bevy of sushi, sashimi and rice rolls. I'm a salmon-loving gal so I got me an extra order of Shake Nigiri. We ended our lovely late lunch with Matcha Ice Cream topped with Azuki beans. There's a lot more to love here, though they serve small, they can fill you up for lunch with their bento boxes which cost starts at P 350. This promo is only served during 11:30 to 2:00 PM everyday. 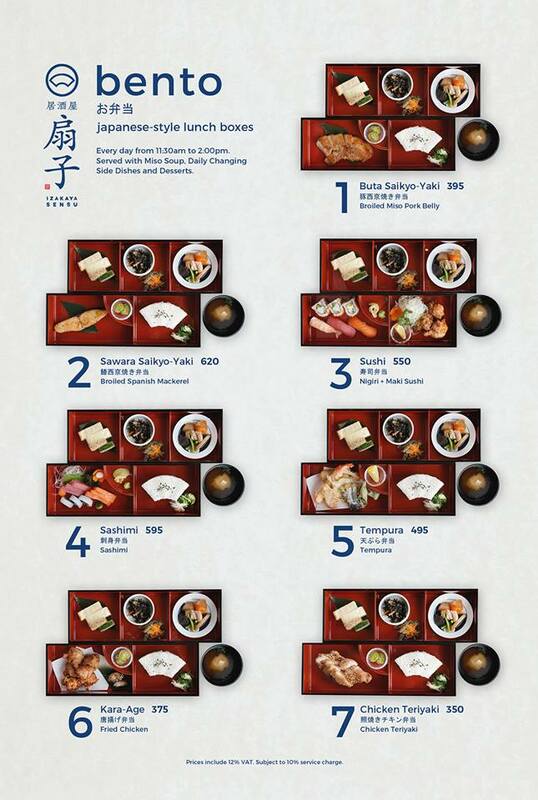 Try it for yourself and discover that they do live up to their catch phrase - #notyourordinaryIzakaya!